Is that any better deinterlacer than QTGMC for lossless deinterlacing ? a. Unless you use a bobber (for QTGMC enable 'Bob') there is no way you are lossless, since you throw out up to half of the motion information. b. You might want to read up on the basics on what happens during deinterlacing. Quote: Motion-compensated bob deinterlacer, based on temporal Gaussian blurring. Reduces noise/grain of the source and does NOT leave the original fields unchanged. Output is rich with details and very stable. It is SLOW. and even with the changes QTGMC made over the years I doubt it is lossless. (07.12.2017, 19:08)Selur Wrote: a. Unless you use a bobber (for QTGMC enable 'Bob') there is no way you are lossless, since you throw out up to half of the motion information. Bob is doubled the frame rate. Since I'm using vapoursynth, FpsDiv is not available. I'm using Bob a long time ago, and the result looks worse than this QTGMC settings. (07.12.2017, 19:08)Selur Wrote: b. You might want to read up on the basics on what happens during deinterlacing. Yeah, I already read that and QTGMC too in many source. Some from avisynth.nl site. I attach the RAW sample from original BluRay & the output deinterlaced encoded sample using that QTGMC settings and my custom placebo settings with crf. The full deinterlaced encoded video output bitrate is about 4000. But, since it using crf, the sample bitrate is slightly different. I cut the RAW and the output deinterlaced using mkvmerge too. So it cutted losslessly. I also attach the frames captured from mplayer and YUV frames using FFmpeg. For better comparison, open each frame with multi MPC-HC (from K-Lite) tabs/windows. I prefer using madVR for it. I know about deinterlace can't be fully lossless, but if you see in the attached "Sample.7z", it looks like lossless deinterlaced for me. I think there isn't any denoise/blurring added in the output. How about you ? What do you think ? I like the results of QTGMC but it isn't lossless, that's the main thing I wanted to convey. + QTGMC has a 'Bob'-option. Without that enabled, up to half of the motion data will be lost. (08.12.2017, 07:07)Selur Wrote: I like the results of QTGMC but it isn't lossless, that's the main thing I wanted to convey. (08.12.2017, 07:07)Selur Wrote: + QTGMC has a 'Bob'-option. 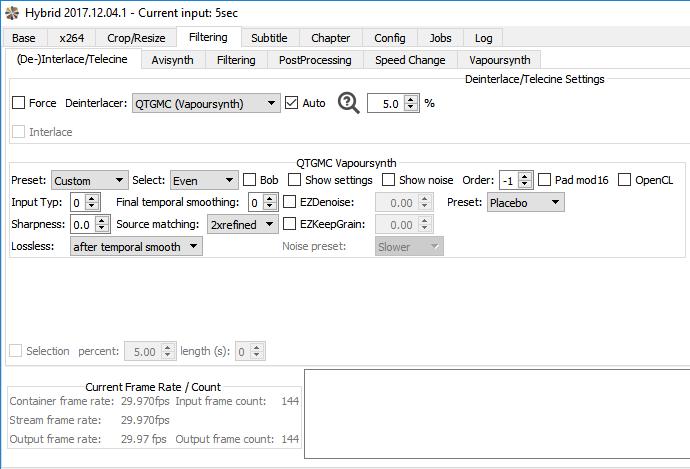 Is there any way to keep the output frame rate when using Bob in "Vapoursynth" QTGMC, since it doesn't have FpsDiv ? Only when 'Bob' is enabled Hybrid will not drop half the frames and output double frame rate output. -> If you want to keep all motion information from an interlaced source using a bobber and keep both interpolated frame is the only way.